First, log in to your Nuuo Titan NVR by entering the IP address into an Internet Explorer web browser on a PC connected to the same network as the NVR. Then follow the instructions of your desired recording mode below. 2. 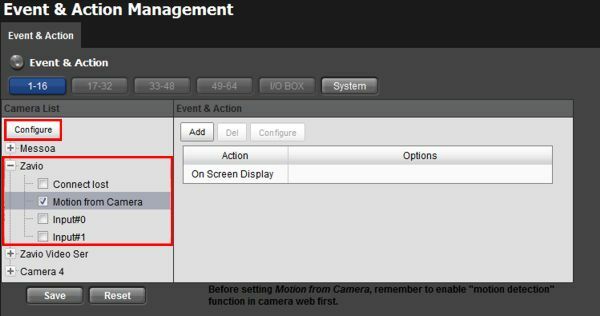 Select a camera from the left column followed by clicking the Motion from Camera box. 4. Once you do this for all of your cameras, click the Save button. 5. Now follow either the Continuous or Schedule Recording instructions below to complete the setup. 4. Repeat the steps above for as many cameras as you need. 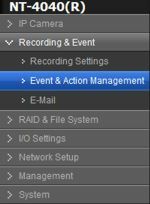 Click the Save button under Recording Schedule once you have configured all of your cameras. 6. Your Nuuo Titan NVR is now recording based on your configured schedule.